Today Adelaide Food Central was invited to taste the menu at Burger Republic, Henley Beach. Think American diner, the foods on offer were completely authentic to America, including menu items such as fries, shakes dogs and subs. We were also served by and American waitress, which really helped to paint a picture. The Mississippi Mud Shake; this thick Hershey Mud shake had chunks of chocolate brownie and smashed cookie pieces throughout. For those of you that have seen Riverdale, it reminds me of the shakes they all sip on at ‘POPS’. I have a soft spot for chocolate so this shake was right up my alley. The other signature shake was the Angel Shake. This thick vanilla shake had chunks of vanilla mud cake, cookie dough stirred throughout, with whipped cream and sprinkles. 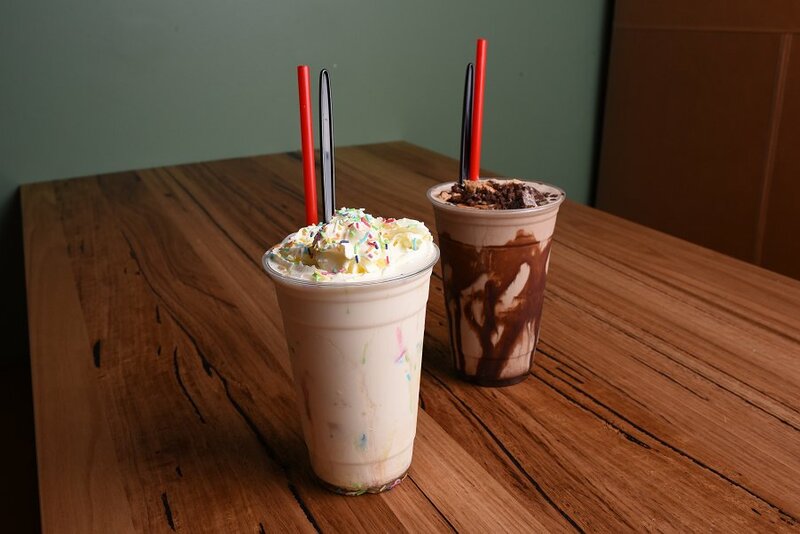 Another delicious signature shake that is sure to dance around on the taste buds. The Godzilla Burger was the first dish up, and really the name says it all. 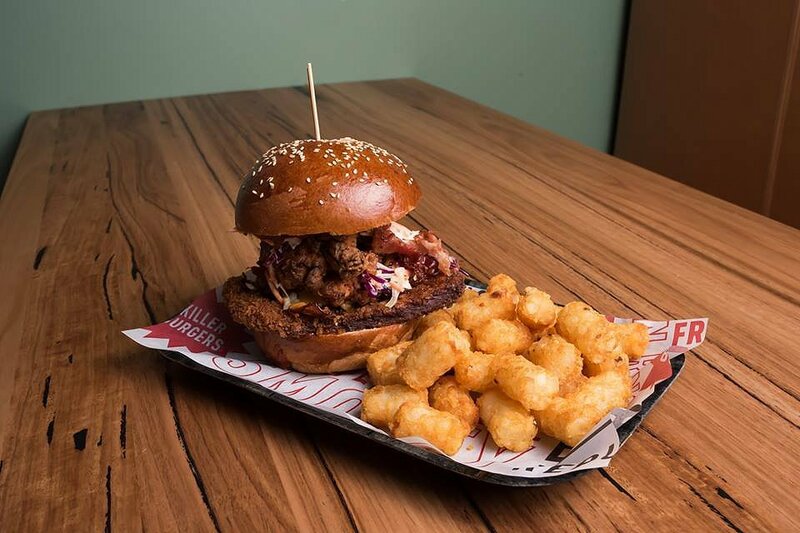 This burger had both a panko crumbed pork loin and fried chicken, topped with bacon, American cheese, slaw and BBQ sauce. Both the pork loin and fried chicken had been cooked perfectly, with a golden crunch. The light slaw helped to break up the meat elements, and BBQ sauce for that extra tang. The Garden Burger was next on the list, and even though there is was a lot of ‘garden’ in it, its still not one for the vegetarians. One of the great things about this burger is the fact is had a huge crumbed mushroom placed in the middle. The burger was then topped with onion rings, red cabbage slaw, BBQ sauce and ranch sauce. As you can imagine, this burger burst with flavour and was probably my favourite dish of the day. 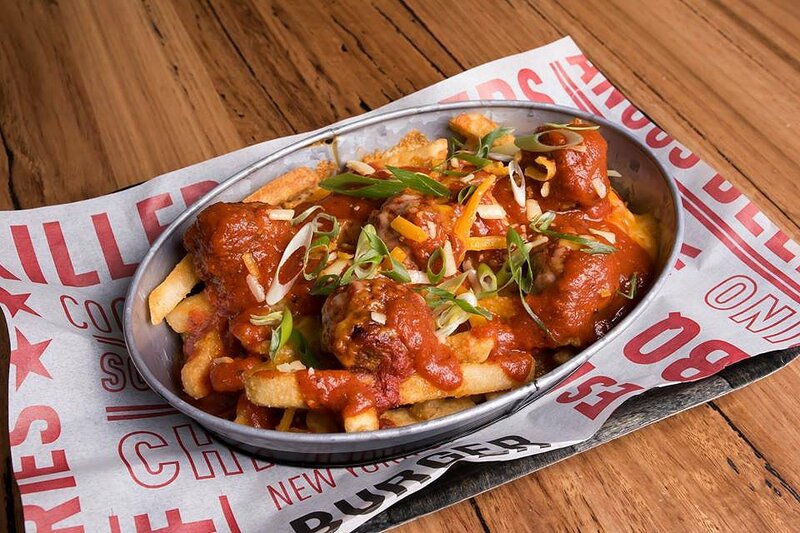 Next up we tried the Cheesy Meatball Fries; thick juicy fries topped with luscious saucy meatballs and gooey cheese. We decided this dish was pretty much a meatball AB. I would love to see this type of concept more in take away shops. 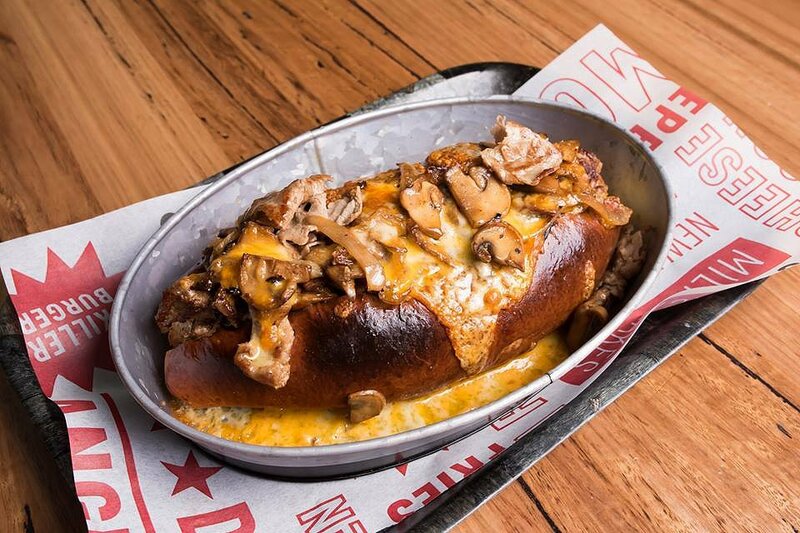 The last dish we had was the Philly Cheese Steak; this sub had shaved steak with mixed grilled mushrooms, onions, capsicum and cheese. All of these elements were pilled into a delicious white roll. Imagine eating a donut but with savoury topping, this is what this dish tasted like. As you could imagine, we were full to this brim after sampling this amazing menu. We would love to thank the staff at Burger Republic for their hospitality and showing us a little taste of America.